Two-time Olympic champion in rhythmic gymnastics, Evgenia Kanaeva, has announced she is going to marry hockey player, Igor Musatov. ­According to Allhockey.ru, Musatov proposed to his girlfriend after her triumphant return from the London Games. 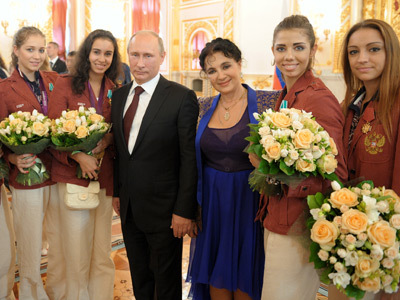 The 25-year-old presented Kanaeva with a diamond ring, a picture of which she later posted in one of the social networks. The date for the wedding hasn’t been set, but the ceremony is to take place this September. Kanaeva is the world’s leading rhythmic gymnast, as the 22-year-old became the first athlete in history to win two Olympic all-around golds in London. Musatov plays hockey for Atlant Moscow region, with whom he reached the KHL finals in the 2010/11 season.